Okay gentlemen, I have to ask: how does one get chin stubble on the bottom of the soap dish? I don’t normally spend a lot of time studying the undersides of my tub’s odds and ends but the other day I took a bath and as I sat that luxuriating in my combination of Epsom salt, vanilla verbena massage oil and vanilla lavender bubble bath, I couldn’t help but notice a rather sizeable collection of tiny red hairs on the bottom of the soap dish. Clearly my brother was shaving in the shower—which is fine; technically it’s his shower too—but how did he manage to get his chin hairs on the soap dish? And while we’re on the subject, I’d like to talk about urination. 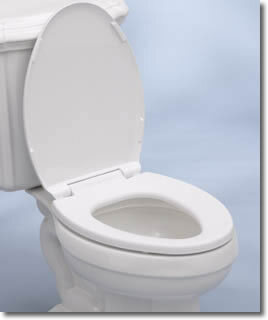 I only clean the bottom most toilet seat when TWD is coming to visit because as a woman, I never use the bottom-most toilet seat and aside from the few nights a month when my brother is home, I’m the only one who uses that bathroom. Well, the last time I got around to cleaning it, it had been a few weeks and I was greeted by an enormous yellow splotch of dried urine. I was mortified. How long had it been there? Had we had any house guests since the last time I cleaned? Had they noticed??? I interrogated TWD right away but he claims that he has impeccable aim. I then moved onto my brother, who claimed that he wasn’t home. I then questioned my father. He has his own bathroom but sometimes he uses mine if he has to leave for work in the middle of the night and doesn’t want to wake up my mom. He claimed innocence as well. So now I don’t know what to do, aside from resigning myself to cleaning the bottom most toilet seat a bit more often. Unless it was my grandfather? They’re not even supposed to be on the third floor. The third floor is the stronghold—the castle keep, if you will. It’s where those under the age of 80 go to vent and drink and resolve their issues before venturing back out into the great unknown (i.e. the living room). But sometimes there’s a breech in security, and even though both of my grandparents sound like they’re about to have a heart attack after climbing the three flights of stairs, that doesn’t stop them from trying. Last week their toilet backed up. I’ll spare you the details but suffice it to say my mother told my grandparents that they could use my bathroom (and shower) until the plumber showed up. My grandfather said no—they would go to a restaurant instead. So gentlemen, who was it? If your brother uses an electric razor then those little guys go everywhere. And since they’re dry when shaving, and everything in the bathroom may be damp after morning showers, they blow all over and stick. Now as far as the yellow spot, we guys get a lot of undeserved grief in this area. Women like to think that we’re so uncaring we just let fly and wherever the heck it goes it goes. But the truth is that you can be pointed directly at the target and the stream might come out at an angle or even in a spray form, causing unforeseen problems. Taking a leak is not an exact science for us guys, it’s more of an art, and like art not every one is going to be a masterpiece. The culprit will never admit it but I’ll go with the brother. Haha– love this: “it’s more of an art, and like art not everyone one is going to be a masterpiece.” I’ll try to keep that in mind. Although upon further reflection, I realized that the “chin” hairs were probably not “chin” hairs considering where they landed… yay for bathroom archaeology, LOL! OMG, I almost fell off my chair…too friggin funny!!!!!!!!!!!!!!!!! For clarification…. sddave gave an accurate description…. I am innocent. I occasionally use your shower so as not to wake the landlord, but I do not use the can there, we have a very nice one one floor below that I pass on the way in or out, so I use it if I do not wish to use the one in my room. Not my problem says I.
BTW, you should always clean both sides of the toilet seat, otherwise that just gets too gross to speak about. As for chin hairs, or what have you, they seem to fly all over, and we can’t get too picky, as our heads of curly hair leave droppings all over, as all of the men in our lives will surely attest too. One just touches our hair and it can cause all sorts of issues. I say, just keep the bathroom clean for all, and clean up after yourself when you use it.